We wanted to learn a new language write some artificial intelligence (AI) with evolutionary algorithms (EA) and then the theme of the Jam was published: Evolution/Revolution. Perfect! In Intelligent Design you control the development of your own species. The goal is to overmaster all other species on the map and to be the only one remaining. 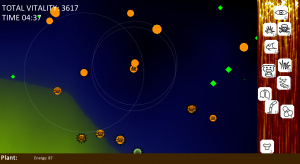 The opponents do a plain evolution via EA while individuals are simulated as swarm. On the right side you can see the "Gene Bar" which let you weight the importance of genes. The higher the gene the more probable that a mutation will choose this. This also applies to mating: the parent genes are mixed and weighted with the given priorities. The second interaction possible is the steering of individuals. 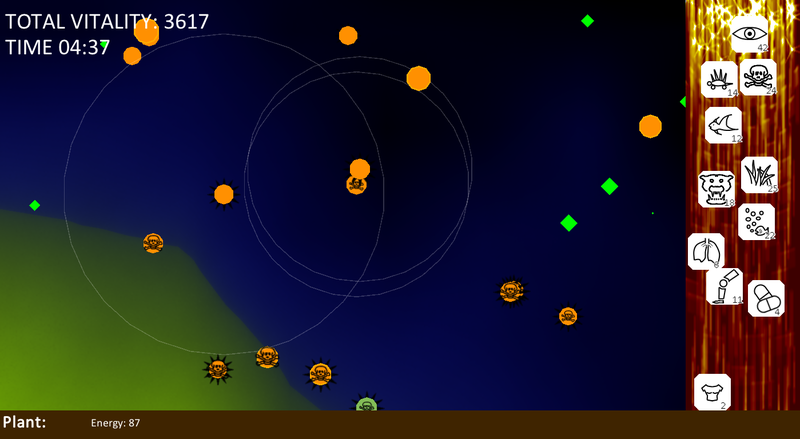 While pressing the left mouse button all entities around the cursor get a speed buff and try to reach the cursor. In some cases this can overwrite there natural reaction and you could starve your animals to death.